Please refer to our stock # A-CBL1 when inquiring. This bucket bench was created with graceful, curving sides enclosing two drawers at the top, a mid-height narrow shelf, and a bench with a two-door storage compartment beneath, all supported on attractive, carved bracket feet. 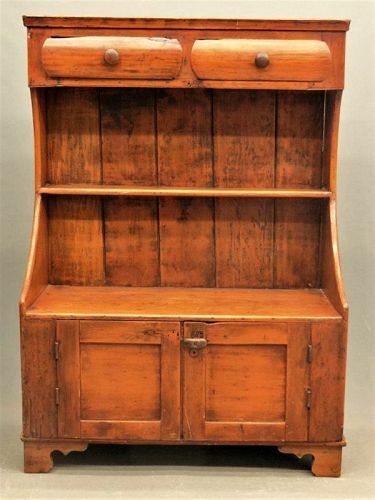 CONDITION: Age appropriate wear, scratches and stains; both top drawers have “old damage” slivers of wood missing on the front top left corners (see photos). DIMENSIONS: 42" wide x 18" deep x 5' high.